The steamer S/S TYN was ordered of a furniture company 1889. S/S Tyn take the workers to and from the company, the company was placed in a place that was difficult to reach on the land. 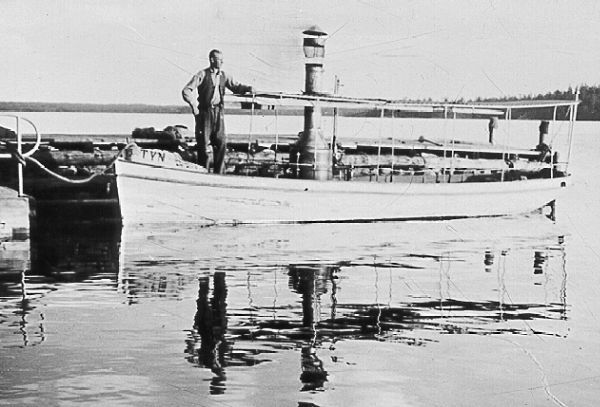 During the day the boat was towing timber to a sawmill. The sawn wood was loaded on a barge and towed to the furniture company workshop. The Boat was fired on the wood rests from the sawing. S/S Tyn was working here until 1939. 1939 a photographer bought her and had the boat for pleasurable tours. 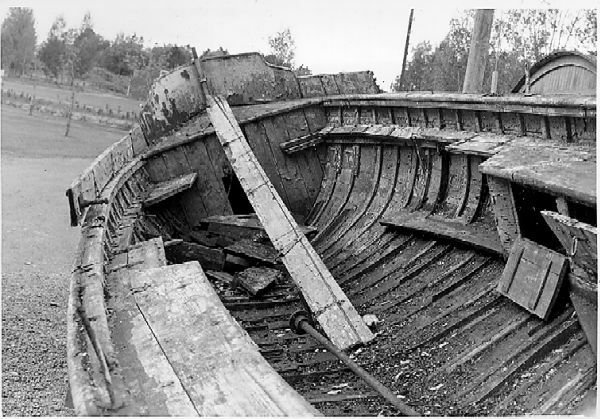 1941 during the Second World War the boat was sold to a Åsviks manor. There it was towing big barges with wood to the farm there the had coal ovens, there the made wood charcoal. After the war the demand of charcoal was decreasing. 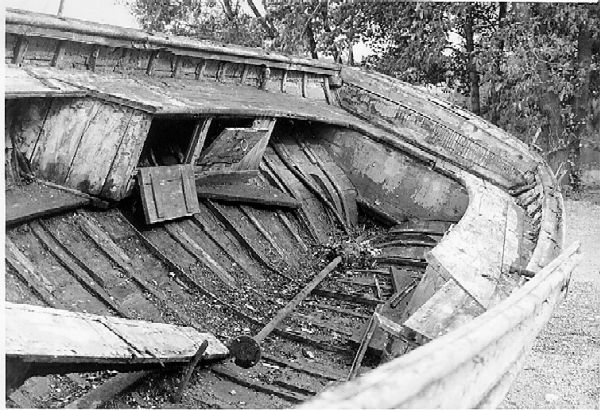 1960 the boat was only laying and falling apart. The son of the photographer bought her 1969, and let the most necessary renovating of the hull be done. 1969 S/S Tyn was sold to a man in Stockholm. He put the boat together and used her for pleasurable tours. 1991 the boiler was so bad that it not more was able to repair it. An bad new designed boiler with the fire place in front of the boiler and reversed combustion was made. It don't worked good, and the boat was since that only laying. 1997 in December two young enthusiasts bought her. A big renovation started. The boat was dissembled completely. The boat has been renovated during to years (4000 man-hour). The machine, propeller and the most equipment is the original from 1890. 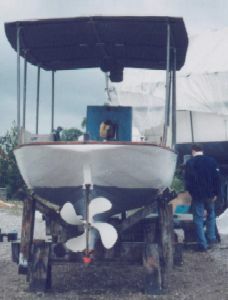 1999 the boat have been through the renovation and get a new boiler that are a copy of the original. And been in the sea for a short time. There is at least one years work left. 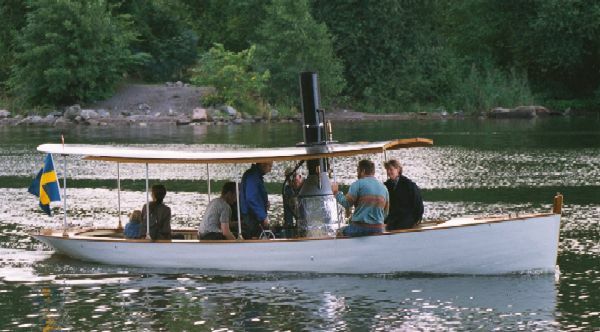 The new boiler in my boat is an copy of the original one from 1890. That is a vertical fire tube boiler with a big fireplace. 55 tubes with diametre 33.7mm. This boiler has a weight of 200kg including all housing, without water. This one take 35 minutes to get 5 bar. I dont want to fire to hard in the start up for the heat forces. 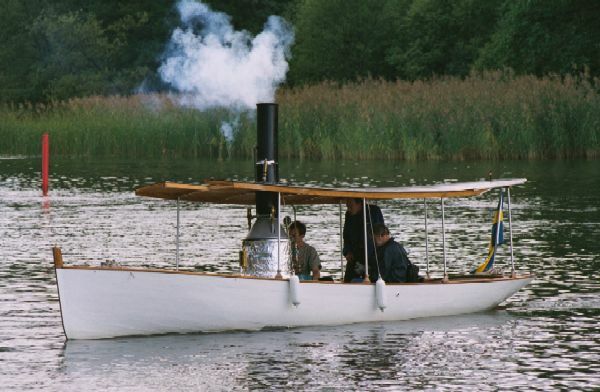 It was designed with 27 litre steam and 47 litre water. That was too little steam volume. Now it has a capacity of 40 litre steam room and 60 litre water. Height 1.1m, diametre 500mm, Diametre 625 including housing. In the tubes there are installed retards, and on the top of the boiler there is a steam-drying pipe (over heater) to get better efficiency. 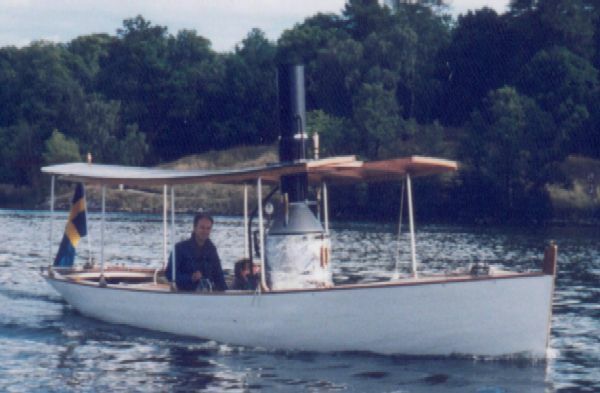 Tomas Blomström is a member of the Swedish Steamboat Association. All text and photos are provided by Tomas Blomström - Thank you Tomas! !